The Air Force and the Navy conducted large-scale joint rescue operation drills in waters off the east coast Tuesday, officials said, as part of efforts to bolster the country's disaster relief capabilities. 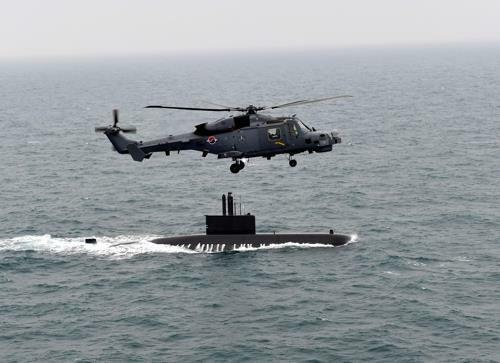 The drills began near Gangneung, Gangwon Province, at 12:10 p.m., involving various military assets, including C-130 and CN-235 transport aircraft, HH-47 and HH-60 helicopters, the 3,200-ton Cheonghaejin salvage ship and deep-sea divers. The maneuvers were based on a scenario in which the military acts on a distress call, with the Navy sending its salvage ship and high-speed boats to check the situation and the Air Force using its transport planes to drop lifeboats and other tools to save people. "The Air Force is conducting the rescue drills on the largest scale," said Lt. Col. Um Kyung-ho, who leads the Air Force's exercise and training branch of the Air Mobility and Reconnaissance Command.